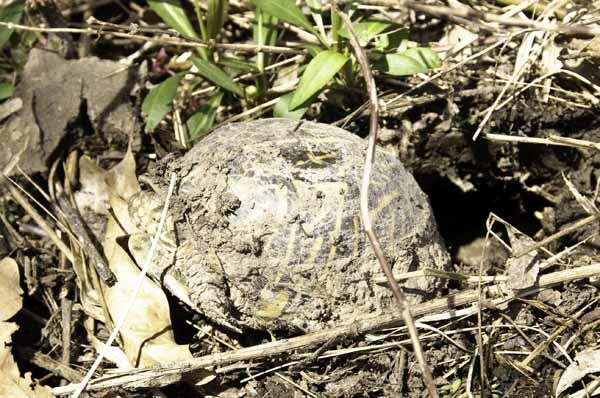 A few weeks ago, the box turtles emerged from their long winter’s nap underground. I found this ornate box turtle not long after it had dragged itself out into the bright spring sunlight. The mud hadn’t yet dried on part of its shell. It didn’t seem happy about being there. The bright light probably hurt its eyes after such a long time in the dark. Or maybe it was just too darned tired after digging its way out of the ground. 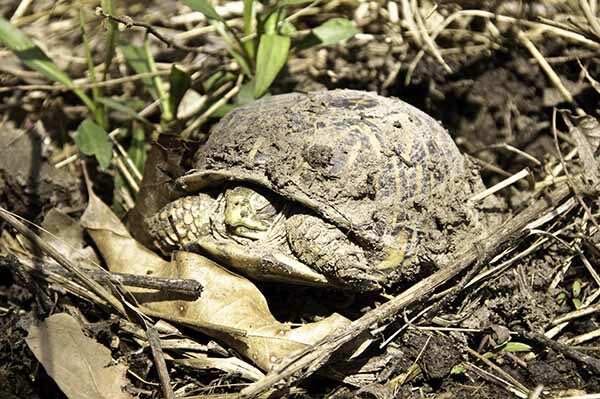 Spending months buried alive might be an effective survival technique for turtles, but the idea of clawing my way to the surface sounds rather nightmarish. The whole thing sounds pretty awful. That’s just the human in me talking though. Turtles probably don’t mind. The trouble for turtles starts after they clean themselves up and settle into a daily routine above ground. Part of that routine seems to be crossing the road. 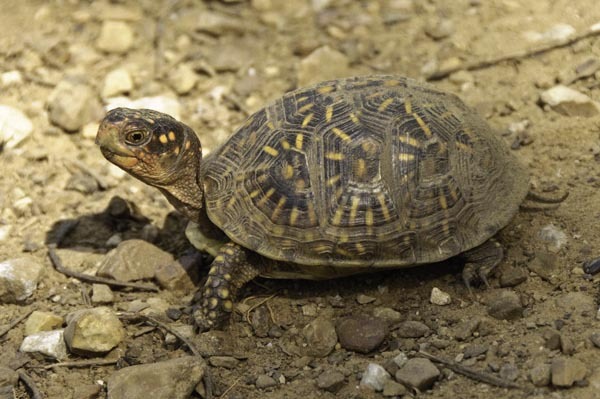 Why did the three-toed box turtle cross the road? To see what was on the other side, of course. Whenever possible, I stop the vehicle and move the turtle to the ditch it was headed toward. It’s my penance for the ones I’ve accidentally killed through the years. 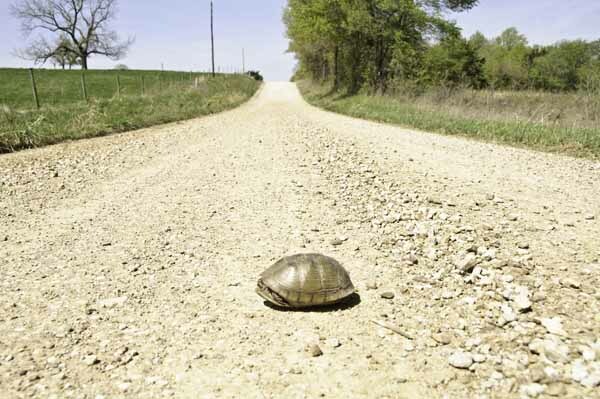 Box turtles can live 30 or more years if they don’t get smashed crossing roads or whacked by lawn mower blades . . . and unfortunately, they blend in so well that they’re often not seen until too late. 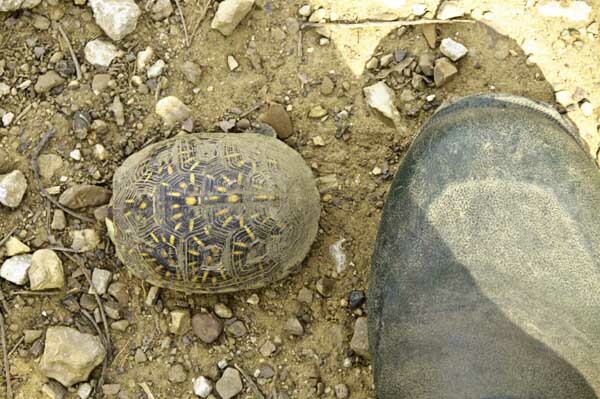 I would have run over this small ornate box turtle if I hadn’t been going really slow and watching for turtles. See . . . very small turtle. That’s a women’s size 8 boot beside it. Well I guess we know why they crossed the road. I put them in the ditch and gave them a lecture on public indecency. I’m pretty sure they ignored me. It is so hysterical that you posted this. I got an award at my sorority’s chapter meeting one night in 1973 for picking up a turtle in the middle of the street on the way to class one morning – that is, I was on the way to class, not the turtle. 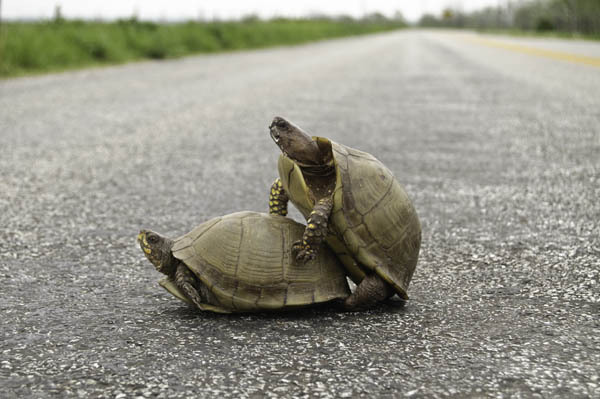 I’ve heard of leap frog, this must be leap turtle.